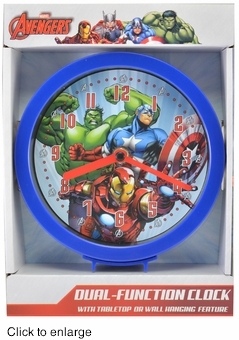 Any marvel fan would love this Marvel's Avengers graphic print Clock. Check in with your favorite Avengers and get the time with this groovy clock which features The Incredible Hulk, Captain America and Ironman all ready to deal justice and defend the weak. The Avenger clock is dual function and can be mounted on the wall or placed on a tabletop. This clock is equipped with accurate quartz timekeeping. The clock body is 6 inches in diameter.